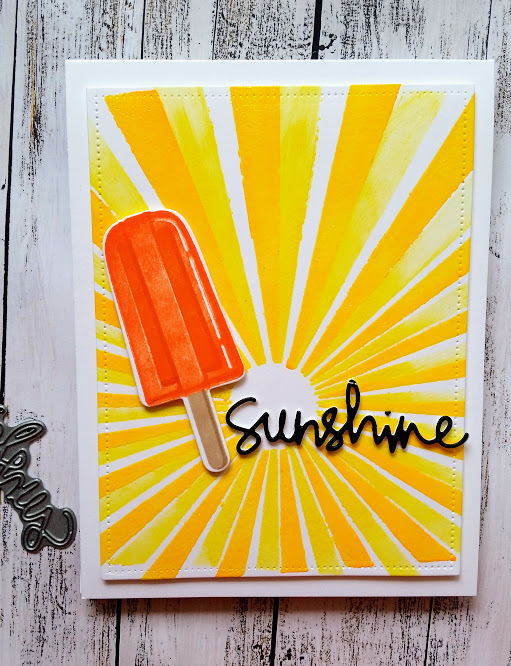 Today I have a card to share using a stencil and 2 different colours of ink. I am also entering this in both the Simon Says Stamp Wednesday challenge here and their Flickrchallenge #100. Both have the 'Anything Goes' theme. I started by placing my stencil and blending the yellow ink. I then rotated the stencil slightly and then applied the orange ink. Before the ink dried I added some clear embossing powder and heat set. The popsicle was previously made. All I had to do was die cut the sentiment with black cardstock. I added some detail to the base of the card by running it through my die cut machine with a dotted rectangle die. 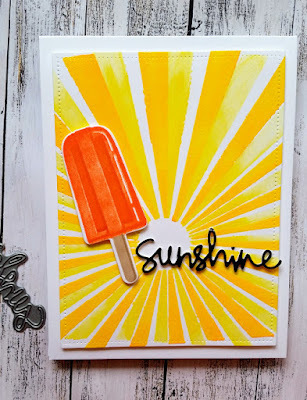 I added foam tape to the popsicle and and foam tape to the stenciled background and then added the sentiment. Well that's it for my card.